The best way to be familiar with a culture is through its language. As part of its commitment to promote San Marino, the Consulate headed by its Consula-General and PJ Lhuillier Group of Companies (PJLGC) President and CEO Jean Henri Lhuillier came up with a two-month program called Tutti Sammarinese ("All about San Marino through its language"). 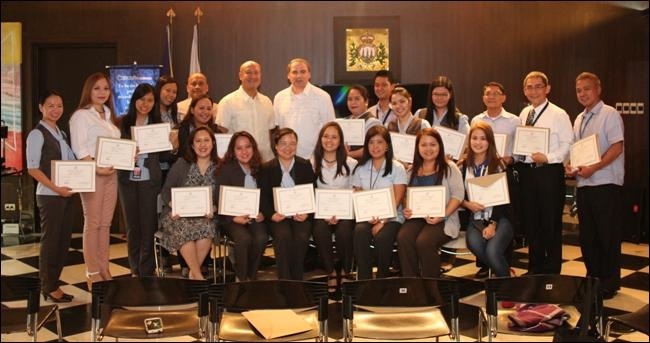 Last July 10, 22 employees successfully graduated from a special Italian language program which started in May. They also received certificates of completion at the San Marino office. "It does take commitment. Working and studying at the same time truly deserve a round of applause. And I'm just very happy that you guys were able to complete it," said JHL to the graduates. The valedictorian of the class, Atty. Rose Ereño, Legal Division Manager, also thanked JHL for giving them the opportunity to learn the Italian language through this program. The classes, which ran twice a week for two months, were facilitated by Lachel Moral, a language instructor at the Societa Dante Aligheri.